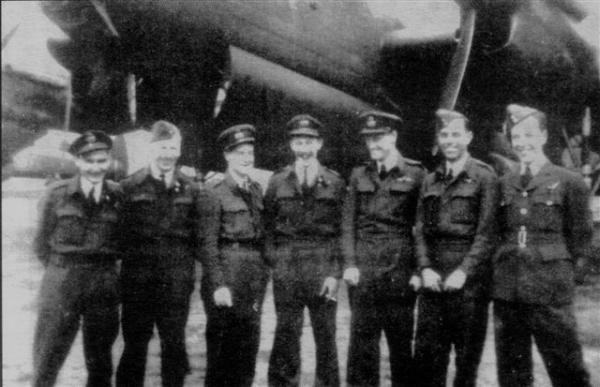 Philip LAMASON from New Zealand and Kenneth CHAPMAN from the United Kingdom stayed from the 13th June to 9th July 1944 at the LE FEBVRE’s after their aircraft had been shot in the night of 7th to 8th June. They have been captured in August during their escape from occupied France to freedom. They have been part of the 168 pilots and crewmembers who have been sent to Buchenwald but who came back. The role played by Philip Lamason in the case of Buchenwald is mentioned in several books, including « 168 Jump into Hell » by Arthur Kinnis and Booker Stanley, « Night After Night – New Zealanders in Bomber Command » published in 2005, and among the many documentaries where it appears is that of Michael Dorsey « Lost Airmen of Buchenwald » released in September 2011 www.lostairmen.com. Mike Dorsey is the grand-son of one of the « 168 Buchenwald, » the 2nd Lt Elmer C. Freeman, USAAF. Photo of the crew is from the book « 168 Jump into Hell » by Arthur Kinnis and Booker Stanley.